It took just seven innings on Thursday for the rest of baseball to witness why the Phillies offense should be considered one of the more dangerous in all of baseball, and Bryce Harper didn't even get a hit. 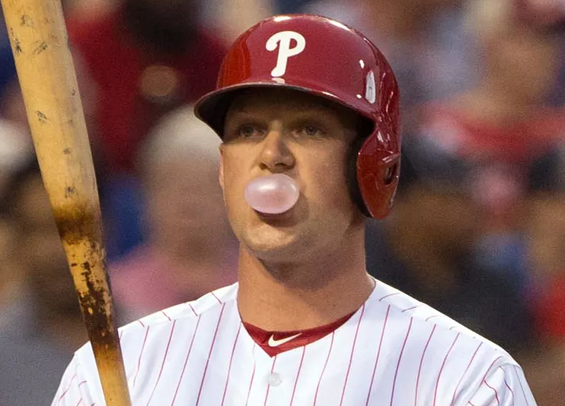 Nope, Harper instead was intentionally walked to load the bases in the seventh inning and Rhys Hoskins followed by depositing his first career grand slam deep into the seats in left field to highlight a Phillies 10-4 win over the Braves on Thursday in the season opener at Citizens Bank Park. "It's scary good," Hoskins said of the Phils' lineup. "There's just not an easy breath of fresh air for the opposing pitcher." Jean Segura collected a pair of hits while Maikel Franco delivered a three-run blast in the sixth. On the mound, starter Aaron Nola struggled at times with his command, issuing a career-high five walks over six innings. Three of those walks came in a rough second frame but he was able to limit the damage to just one run. He collected eight strikeouts on the afternoon to notch the win. Andrew McCutchen opened the game with a leadoff homer, becoming just the third player in Phillies' franchise history to hit a leadoff blast and the first to do it in Philadelphia since Heinie Mueller did it in 1938 at Shibe Park. McCutchen's blast also ignited an already raucous sellout crowd, setting a high-energy tone for the entire afternoon. "It felt very much like October out there," manager Gabe Kapler said. "It's quite a feeling to walk out onto that field and feel the support that we felt today. People have told me in the past what this place was like when the team is winning, and it felt like we had already won several ball games when we walked out onto that field." The two clubs resume their three-game set on Saturday afternoon.